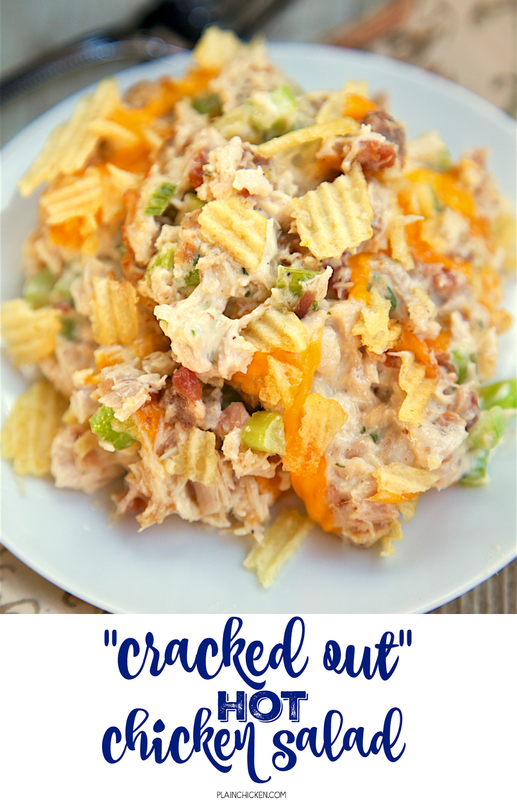 Cracked Out Hot Chicken Salad - baked chicken salad loaded with cheddar, bacon and ranch! 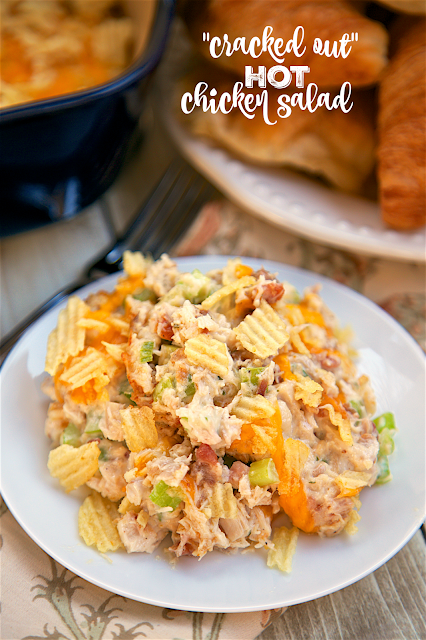 Chicken, mayonnaise, celery, lemon juice, cheddar cheese, worcestershire, bacon, ranch dressing mix, potato chips. SOOO good! Can make ahead of time and refrigerate until ready to serve. Great for a quick brunch, lunch or dinner. Chicken Salad is one of our favorite quick lunches. I will whip up a batch, and we will eat it for a couple of days. I was looking for something a little different for lunch the other day. 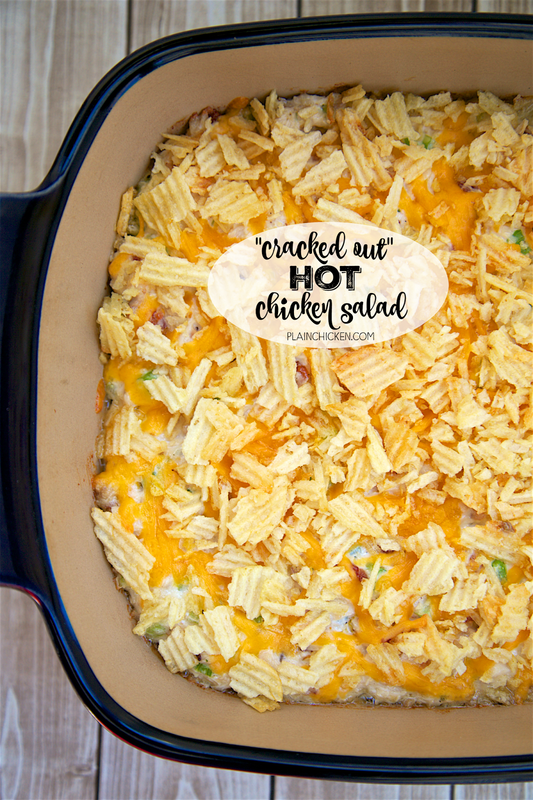 I decided to "crack out" our favorite chicken salad recipe and bake it. OMG! SOOOO good. We loved the addition of the cheddar, bacon and ranch. This "Cracked Out" Hot Chicken Salad was a fantastic change to our usual chicken salad sandwiches. 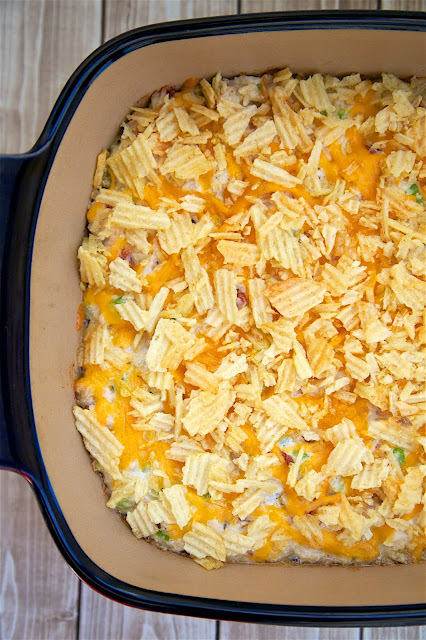 It was so delicious baked and topped with potato chips! We served this with some fruit and croissants. You can make the chicken salad mixture ahead of time and refrigerate it until you are ready to bake the dish. This is perfect for brunch, lunch or dinner! It is guaranteed to your new favorite chicken salad recipe. Preheat oven to 350 degrees. Lightly spray a 8x8-inch pan with cooking spray. It is cooked chicken - I'll adjust the directions. what do you mean with ranch mix? Living in The Netherlands, this sounds unfamiliar for me. The most common ranch mix hear in that states is Hidden Valley Ranch mix. It is a dry packet mix, but you can use any brand, but I am not sure you have it in the Netherlands. Can you post your recipe for Chicken Salad? I've been craving some recently. I'm adding this version to this week's menu! Yum. This stuff is so good I've made it twice this week! And it's only Wednesday. (smile) Thanks Stephanie. Happy Holidays! Is there a substitute for Worcestershire sauce? Can I substitute raw onion for onion powder?